Blessed with so much diverse natural beauty, fauna and flora, it is only to be expected that National Parks in Thailand are plentiful and a huge attraction. 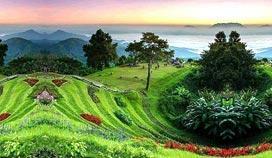 We have listed and given a brief overview of the most parks in areas like Chiang Mai, Krabi and Phuket. If you are heading in any of these popular Thailand destinations, we trust the abbreviated information below will help you plan your sightseeing itinerary and make the most of each moment. Kanchanaburi is located 2 hours west of Bangkok offering attractions like the tiger temple and The Bridge over the River Kwai where you can stay in floating raft houses. 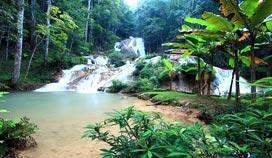 Its biggest attractions is its natural beauty and The Erawan Park with its 7-tiered waterfall is top of the list. This park is located in Nakhon Ratchasima in Khorat (central Thailand) and one of the biggest in the country. It features a selection of trails to hike ranging from several days to an hour or three. 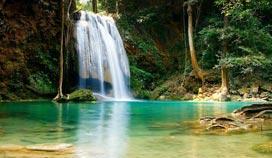 Several waterfalls and streams will be found along the way. 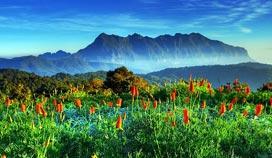 Doi Inthanon is located in Chiang Mai and include the Dio Inthanon Mountain which has the highest peak in Thailand at 2 565 meters. The picture you see is a Chedi located inside landscaped gardens next to a temple which is build on the mountain slope 2 km from the top. 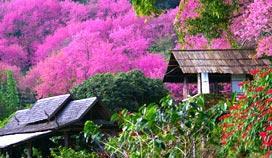 Chiang Mai is famous for its tranquil nature of forest and mountains. As a result it features many national parks. His Majesty The King initiated the creation of this park to stop encroachment and threat to fauna and flora. You can visit this park by organized tour or even rent a car and visit at your own time and leisure. The Doi Suthep mountain also feature a beautiful temple, towers and statues at the mountain's highest peak which is a big attraction. With the Mae Chaem River flowing through a gorge in the park it is also called the Grand Canyon of Thailand. It is only an hour' drive outside Chiang Mai City and a great day trip destination while visiting this region of the country. Valleys, glittering streams, mountains and stunning waterfalls is what awaits you in this 6th largest national park. 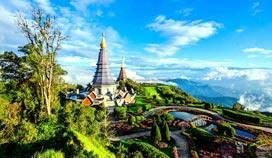 Located approximately 55 kilometers from Chiang Mai City the park is home to no less than three large forests with exotic birds , animals and hiking trails waiting to be explored. Khao Sok is one of the most beautiful in Thailand and it is within an easy 45 minute drive from Phuket. 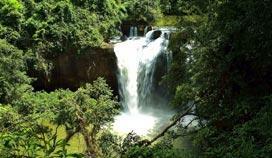 It's pristine moist evergreen forests abound with wildlife and fascinating plants is an awe inspiring sight. Accommodation is available in the form of floating lake cabins and tree houses. Amazing! Khao Phanom Bencha covers 50 square kilometers and is located in the province of Krabi, just a few kilometers from Krabi Town. The mist covered park is home to a host of wildlife and pristine rain forest. 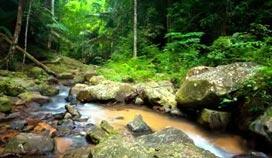 Another beautiful area located in Krabi famous for its natural beauty is Thanboke Khoranee National Park.